Bosnia & Herzegovina (usually shortened as BiH) is a small European country located on the Balkan Peninsula. Not as well known as its neighbours Croatia or Montenegro, it’s a great destination for those looking for places off the beaten path. It’s a country where East meets West, which comes with an interesting mixture of different cultures, traditions and religions. This seemingly modest country has so much to offer. Bosnia & Herzegovina is home to many mountains, rivers, waterfalls and other natural attractions that make it appealing to outdoor lovers. You can even enjoy the Mediterranean climate at the country’s short coastline with access to the Adriatic Sea. 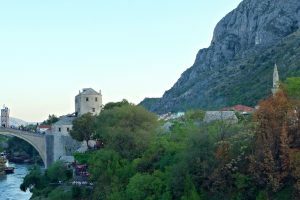 Fascinating historical past, medieval towns, cultural heritage, unspoilt nature, friendly locals, low prices and great food – these are just some of the reasons why you should visit Bosnia & Herzegovina on your next trip in Europe.